The emergence of a venue named “Royal Dragon Casino” (pictured) in a refurbished building near the Macao Polytechnic Institute in downtown Macau has caught some local industry observers by surprise, with several asking under what terms and conditions an apparently new-to-market casino venue might be allowed to operate. It had been widely understood locally that Macau had a moratorium, introduced in 2008 during the time of Macau’s first chief executive, Edmund Ho Hau Wah, on so-called service agreements – where third-party investors piggyback on the licence of one of the existing six operators. The moratorium was flagged as being designed to limit market expansion. The property – not currently open to the public – also carried as of Tuesday a sign saying “Hotel Royal Dragon”. 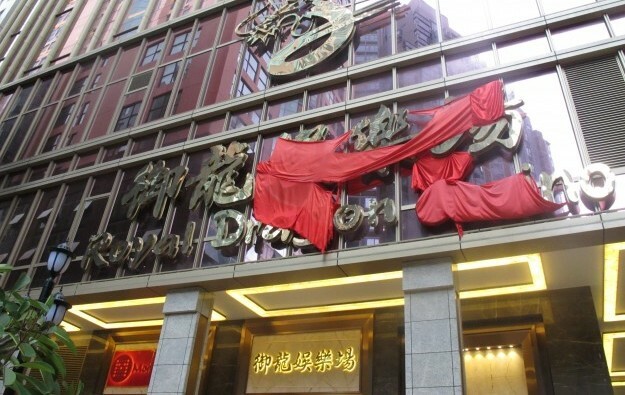 The dragon logo at the new property appears to be similar to that on the building at nearby casino hotel Golden Dragon, a property run by Golden Dragon Co Ltd. The firm is chaired by Chan Meng Kam, a veteran Macau legislator and a local casino boss. Mr Chan is also chairman of Hotel Royal Dragon (Macao) Co Ltd, the promoter of the new hotel property, according to official records seen by GGRAsia. The casino at Golden Dragon makes use of the gaming licence of Macau casino operator SJM Holdings Ltd. Another venue also run by Golden Dragon Co – Casino Taipa Square – is operated under the licence of Melco Resorts and Entertainment Ltd.
GGRAsia was able to contact Mr Chan by telephone but he did not respond to questions about whether he or his businesses were connected to Royal Dragon Casino. GGRAsia approached the Office of the Secretary for Economy and Finance, asking for comment on the new Royal Dragon Casino. It referred us to the local regulator, the Gaming Inspection and Coordination Bureau. The latter had already stated it had “not received any official letter from any of the gaming concessionaires seeking approval for opening [a] new casino” at that site. The gaming bureau said, following our inquiry to the Office of the Secretary for Economy and Finance, that it had “no additional comments” regarding whether there was any permission for gaming operations at the new property. Casino industry consultant Ben Lee of IGamiX Management and Consulting Ltd said he was “caught by surprise” about the emergence of Royal Dragon Casino. Wang Changbin, director of the Gaming Teaching and Research Centre at Macao Polytechnic Institute, also expressed some surprise. “I wondered why the government did not look into the matter [the completion of Royal Dragon Casino],” Mr Wang told GGRAsia. The scholar also had doubts on what licensing conditions might allow Royal Dragon Casino to have gaming operations. Currently only SJM Holdings, Melco Resorts and Galaxy Entertainment Group Ltd have service agreements in operation in Macau. GGRAsia approached in person SJM Holdings executive director Angela Leong On Kei regarding whether the company’s gaming licence would cover Royal Dragon Casino. She referred us to the corporate office. The corporate office did not reply to several enquiries about the topic. A sign previously seen on the Royal Dragon Casino building – for local slot parlour brand Mocha Clubs, part of Melco Resorts – was no longer present as of Tuesday. Melco Resorts had declined to comment when approached about the Mocha Clubs sign. In a follow up phone call from GGRAsia on Wednesday, the firm also said it would not comment regarding the disappearance of the Mocha sign. Maria Helena de Senna Fernandes, director of the Macao Government Tourism Office (MGTO), confirmed on the sideline of an event on Wednesday that the bureau was assessing an application for the licensing of a hotel on that site. “We have received an application for licensing a hotel on that plot,” Ms Senna Fernandes told reporters, without identifying the scheme’s promoter. “They have submitted all the documentation and the licensing process is under way. Whether or not there is a casino inside the property, it [casino licensing] is not within our responsibilities,” she added. The MGTO director did not confirm if the licensing of the hotel would be completed before the end of September, in time for the property to open for China’s Golden Week, a holiday period at the start of October, marking National Day.